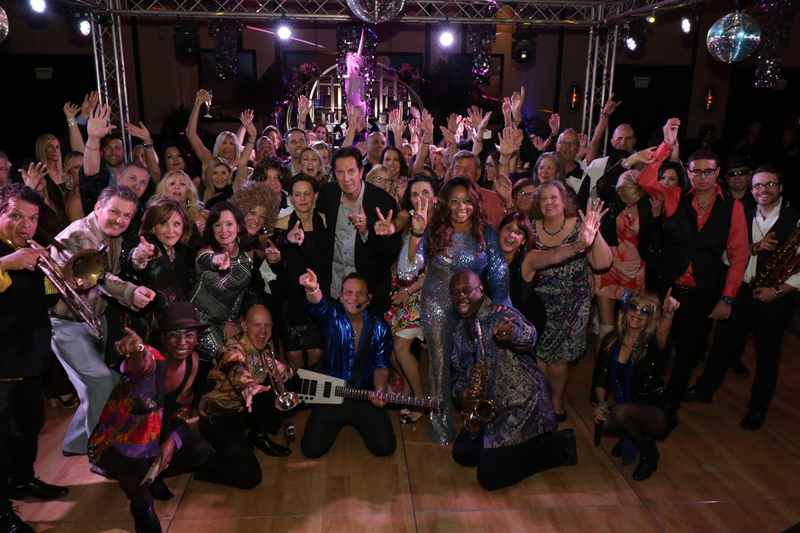 Boca Raton FL – March 4th, 2018 – On Sunday March 4th, 2018, The Unicorn Children’s Foundation, along with chairs Gregory Fried and Kurtis Lutz, hosted its first ever, non-formal, Disco & Diamonds Gala at the Boca West Country Club in Boca Raton, Florida. The evening was a resounding success, and had several surprises for guests, not the least of which was the unveiling of an exciting new initiative: the Special Percs Café©. Guests, arriving in disco attire, were greeted with a wide range of exciting Silent Auction items during cocktail hour, followed by a Live auction including such rarities as two tickets to the Steve Harvey show with backstage tour, and a 13K color sapphire & diamond necklace, generously donated by Gregory’s Fine Jewelry. Melissa Hassan, teacher extraordinaire at Unity School in Delray Beach, was inducted into Unicorn’s Visionary Society, an exclusive club that recognizes extraordinary women who are united by their acts of generosity to help kids with special needs excel in the community. Michael Simpson, Owner at Little Stinker LLC, and Richard Rawlings, of the Gas Monkey Foundation, were both inducted into the prestigious Order of Unicorn, which consists of philanthropic men who have demonstrated their commitment to improving the quality of life for those with special needs through generous financial contributions. Dominique Rivera, 2017 Royal International Miss Teen, was awarded the Unicorn Youth in Service award in recognition of her exceptional volunteer work in her community on behalf of individuals challenged with invisible disorders. Dominique then wowed the crowd with a personal heartfelt performance of ‘My Life’ by Donna Summer, which brought tears to the eyes of many. The event culminated with the unveiling of Unicorn’s very exciting new program: the Special Percs Café©, an initiative designed to address gaps in cradle to career pathways for kids and young adults with special needs. In partnership with Mammoth Coffee Roasting Co, a California based small batch roasting coffee company, this café will provide vocational training and employment options for young adults with special needs. Unicorn hopes to create a path for these individuals to become more valued, accepted and included within the community through meaningful employment options in a competitive high-demand industry, as well as give their lives meaning and purpose one cup at a time, while providing a high quality customer experience. Finally, when the event ‘concluded’, guests were treated to one final surprise: the opening of a Studio 54 themed disco after party, where the acclaimed 11 person Private Stock Band brought down the house for many hours, complete with disco balls, lasers, full dessert bar, and more. A big THANK YOU to this year’s supporters: Gail Wasserman Family Foundation, Silvana & Barry Halperin, Sunshine Health, United Capital, Berkowitz Pollack Brant Advisors and Accountants, Schmidt Family Foundation, Anne & Norman Jacobson, Gregory’s Fine Jewelry, Mammoth Coffee Roasting Company, D3 Advertising, Simple The Best Magazine, the Boca West Country Club, and finally a joint partnership between BNY Mellon and Ouzo Bay restaurant, who provided the amazing Wine Wall at registration. With 1 of every 6 children affected by some form of intellectual or developmental disability, most of us have experienced the challenges first-hand or know someone who has. There are a wide range of opportunities to be involved; to connect and learn more about the Unicorn Children’s Foundation please visit www.UnicornChildrensFoundation.org.